WARNING: Some links (especially in the first and definitely the fourth section) are definitively NSFW. You’ve been warned. bildungsroman (German): a literary genre which focuses on the psychological and moral growth of the protagonist from youth to adulthood. One of my favorite stories in the bildungsroman tradition is Joyce‘s short story “Araby,” but we’re all familiar with this particular genre. Whether it’s tragically canceled shows or more mainstream fare, there’s no shortage of Hollywood narratives built off of acne-ridden, teenage angst to reassure us that we are not alone. deus ex machina (Latin): “god out of the machine”; a plot device whereby a seemingly unsolvable problem is suddenly solved with the contrived intervention of some new event, character, ability or object. Classically, deus ex machina has been used since its birth in Greek tragedy — but who actually reads that stuff? A much cooler example is H. G. Well’s War of the Worlds, in which a devastating alien invasion is thwarted by the common cold. The ark opening scene in the first Indiana Jones film, wherein God literally (and literarily) melts him some Nazi faces, is a solid modern example. It should be noted that the deus ex machina here isn’t actually God bringing down the hammer on the SS, but the fact that Indy (despite no former mention of it in the film) knows to close his eyes to avoid the holy wrath. in media res (Latin): “into the middle of things;” the literary and artistic narrative technique wherein a story begins either at the mid-point or at the conclusion. The classic example is of Odysseus derpin’ with Calypso. (Incidentally, here’s some stop motion I stumbled across while looking up that last crap-tastic television movie. Why? Because men who somersault into green fireballs that produce some kind of heat-based force field are okay in my book.) Anyway, the modern example couldn’t be anything but this fine piece of cinema. Oh, and this one, too. Oh hey, and this guy. Hm … hmmmmm. I just passed my English comps and what is this. This is one of my favorite Thrill posts so far. Then, in the words of a famous Thrill writer, there is. . .wait for it. . .Deus ex moccasin. Which translates (maybe): If the shoe fits, or give fits, blame the guy upstairs. that meme is really stupid. 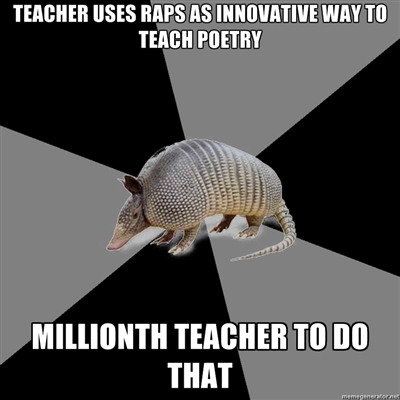 what is the point of the armadillo?